Philip Glass used to say he was never composed opera per se, but ended up rubbing shoulders with Verdi and Wagner because opera houses had the needed theatrical apparatus. Was he buying time while figuring out how to write recitatives his way? Was he creating a hybrid? Both? Whatever the case, Glass’ first mainstream-ish opera, Satyagraha, was no easier to define Nov. 4 at the Brooklyn Academy of Music in a Sweden-imported production by Folkoperan and Cirkus Cirkor after 37 years of making the opera-house rounds. It looks, sounds and sometimes acts like opera but… is it a pageant, meditation, oratorio, all these things or none of them at the same time? In my mind, I sometimes re-make pieces, shoe-horning them into what I already know, if only because that’s the only way to parse them. But Satyagraha just doesn’t fit. It has characters but not characterization, narrative that’s stationary rather than dynamic and represents reality but only vaguely resembles it. 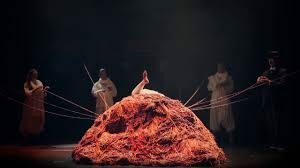 Most radical: Though the eternal challenge of opera is to create a coherent fusion of words, vocal line, instrumental accompaniment and scenic elements, Satyagraha has all of those elements not in a fusion but in separate, independent streams. 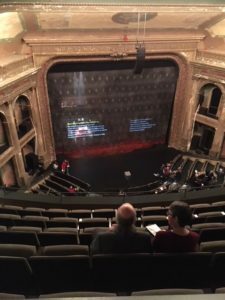 The opera is constructed as a series of key moments, the production at BAM offering sign posts in the form of text projected on an outer scrim. What is sung is Constance DeJong’s adaptation of the Bhagavad Gita, functioning to enhance the emotional temperature of the stage action but not necessarily illustrating or dramatizing it. Scenic elements also create their own related but different world. How everything does or does not come together exists in the mind of the beholder. Or not. Many people listen to Satyagraha intuitively and don’t really want to account for how or in what way the piece has reached them. And that, I believe, is why the following for Satyagraha is eternally young: There are no operatic pre-requisites for taking it in. I’m willing to bet that none of the people around me on Sunday were even born when I saw Satyagraha at its 1981 U.S. premiere in the unlikely setting of Artpark, a semi-outdoor performing arts center north of Buffalo, NY. The many between-genre crevasses in the piece were explored by the Swedish Folkoperan and Cirkus Cirkor, in both broad and subtle strokes. Circus acrobats alighted on this chronicle of Mahatma Gandhi’s evolution as a non-violent protester, and nobody at the Nov. 4 performance that I attended seemed fazed. 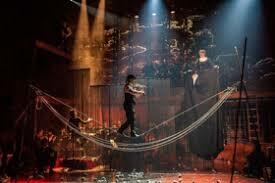 Tightrope walkers and jugglers were cheered like divas who hit the right high notes. Thanks to Cirque du Soleil, this generation easily accepts that circus acrobatics aren’t cheap entertainment but can be a highly expressive visual medium, which is how such physical theater could become an abstract commentary on Gandhi’s thoroughly internal evolution, used something like the dance interludes in a Rameau opera. I’m not saying acrobats are the best way to go, but they’re an option, if an eccentric one. The piece was written to have a visual component – one reason I hadn’t touched my Satyagraha recording in the past 30 years (despite the fact that it’s on nasty-sounding cassette tape). Sound-only recordings can seem like a ballet score without the ballet. Glass’ operas tend to outsource a certain amount of storytelling to the designer and director. It’s not the music’s job in Glass music theater. In Einstein on the Beach (Glass’ first opera, his most loved but one that has remained outside the mainstream), you didn’t know or care what it had to do with Einstein or beaches. Glass’ score was the work of a young composer going from scene to scene with an escalating level of purely musical invention that seemed to say, “Can I top this? Just watch me!” But as a long-time Buddhist, Glass wasn’t about to be so self-directed with Gandhi in Satyagraha. And the last thing he needed was the kind of debts piled up by that wild and woolly Einstein on the Beach world tour that sent him back to cab driving on the streets of New York. While Einstein required Glass’ own ensemble, Satyagraha could be slotted into operatic repertory. It didn’t need his physical presence. It was written for typical opera house forces, though ones that required the musicians to count time assiduously rather than just feel how the music flowed from event to event. In time, performers have discovered that approach isn’t optimum. In the Sony label recording, the score is treated like some sort of Rube Goldberg machine that need only be set in motion to do its job. Luckily, conductor Dennis Russell Davies has always conducted Glass as music with a capital M, yielding an extra richness and expression. The Swedish production, conducted by Matthew Wood in a reduced orchestration, felt similar. And though Glass’ wonderful ear for instrumental color hadn’t yet fully developed in this score, you heard it coming thanks to the orchestral and vocal sympathy of this production. So what, exactly, did this thing look like? Never was was the imagery a free for all. For a story that documents key moments in Gandhi’s life between 1896 and 1913, director/designer Tilde Bjorfors had an antique, pre-World War I vibe to the decor with warm, even homey lighting. The most specific storytelling came from video projections – not many – containing real people and real images, something like a newsreel. Much in spirit of Robert Israel’s original Glass productions of Satyagraha and Akhnaten, several independent events were happening on the stage, reminding you the priority is not an exterior dramatization, but projecting an inner landscape in the minds of key persons. So anything linear is not to be expected. Symbolism was obvious – a seesaw had acrobats representing forces of good and evil bouncing each other up and down, though unexpected twirls and flips on the side of “good” suggested an underdog agility. Men stood on each other’s shoulders. The gallery of images could be largely described as dangerous acts accomplished under precarious circumstances. A mound of red yarn seemed to spread its symbolic humanity with strings stretching out different directions. A tightrope walker was handed a violin – by a female stiltwalker in a 20-foot-high hoop skirt who, in an earlier scene, portrayed Mrs. Alexander, the wife of a South African police chief who defended Gandhi. That made good poetic sense. And yes, there were singers onstage who clearly played certain people. Most obvious, of course, was Gandhi, convincingly sung by Leif Aruhn-Solen though with a mainstream tenor voice that made you miss the more pure ethereal pipes of Douglas Perry, whom I first heard sing the role. But there will never be a definitive production of Satyagraha or anything close to it. Too many of its key elements are open ended. And because of its hybrid nature, you can’t even riff on pre-established points of reference from opera history. At one point, an act from Glass’ Akhnaten was paired with an act of Tristan und Isolde in a Philadelphia Orchestra concert conducted by Dennis Russell Davies. It was not a success, but shortly thereafter, Glass confessed that it was his first exposure to the iconic Tristan score. Really? What that tells me: Satyagraha wasn’t created as a reaction to anything previously existing in theater. It was not an endeavor to do something that hadn’t been done before. It was a fairly pure counter-revolutionary act of creation, dedicated to the work of Gandhi, whom we need now more than ever. One of many things attributed to Gandhi is “The right option is the kind option.” You could put that into practice after hearing Satyagraha.